39" Twin. A complete linen set is available for an additional $10.00 per week that includes a bottom fitted sheet, top sheet and pillow case. Please scroll as it is listed as a seperate item. Built-in electric pump. Linen set also available(top sheet, bottom sheet pillow case add $10), blanket ($10) or pillow ($5). Easy to set up and tear down. They blow up by themselves. Pump included. Why bring sheets on vacation? 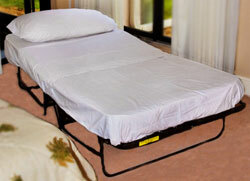 Rent a bottom sheet, top sheet and pillow case for your roll-a way, twin or queen aero bed. Bed Pillow. Pillows are laundered between rentals and are delivered in bags. twin or queen size available. 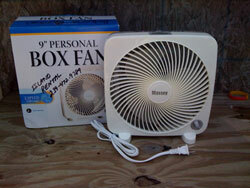 For added circulation or the sound that puts your child to sleep. Colors and style may vary. 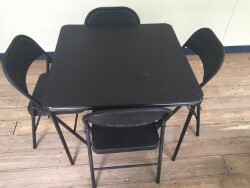 Standard size card table with 4 metal folding chairs. Getting married on one of our islands? Having a large family gathering or meeting? 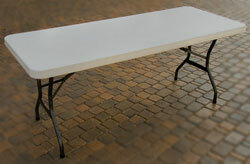 If you need the item for 1 or 2 days, the cost is $12.00 per table. Please call to order. Having company and dont have enough chairs? Getting married on one of our islands? 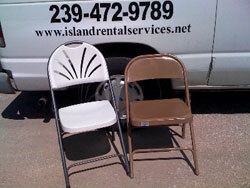 Standard metal folding chairs. If you need the item for 1 or 2 days, the cost is $2.50 per chair. Please call me to order.